You say Tomato, I say Passata! Take a few minutes to watch the four links from last year's Passata Day, by The Source. The Youth Food Movement is an inspiring group of young people committed to a sustainable way of living. Together with The Source, they are preserving the Italian tradition of making fresh tomato sauce and community connectedness. Weekends have been committed in diaries, garages are being decluttered and cleaned, pricing is being compared, menus are being set, roles are being delegated, equipment and supplies are being sterilised; and excitement is growing! The Tomato Season is here! The Tomato Season is not just about making tomato sauce, it's about preserving the Italian way. It's about bringing family, friends and communities together to celebrate a culture of food, sharing, remembering loved ones, keeping family traditions alive and creating lasting memories. It's a lot of hard work, the backdrop will be children playing, music, singing, laughter, chatter, nonni's cooking and the sharing food and wine. The lunchtime menu is likely to be a feast of pasta, last years tomato sauce turned into a Salsa al Pomodora, Bolognese or Ragu, crunchy bread, cheese, fruit and biscotti. This will be the only break! The end result will be preserved bottles of fresh tomato sauce orPassata. 100's of them, enough for a year, enough for everyone! And the family tradition has been preserved for another year and lasting memories created for new generations. The bottles will be used as the base or foundation for family meals throughout the year for pizza sauces, pasta sauces, casseroles and chutney's. Bottles will be shared with friends and families. I really enjoyed watching the links from The Source, covering the Youth Food Movement's Passata Day, because this group of young people really get it! They are not only celebrating an Italian tradition, they are about getting people and communities together, preserving the principles of food sovereignty, and respecting our environment. It doesn't matter what nationality they are, how young or old, whether it's their family tradition or not. They have started a new annual tradition, that celebrates food, sustainable living and community. They are seeking donations to assist them to expand their 2013 Passata Day. You can pledge a donation by following their links. So, like the Youth Food Movement, and the team at Home Make It, whether you are reviving an old family tradition or starting a new family tradition, you are helping to save the 'passata day' and preserve the Italian way. The Home Make It team shared their passion for homemade tomato sauce last Saturday at Preston Market, hosting Tomato Sauce making demonstrations on the Main Stage. 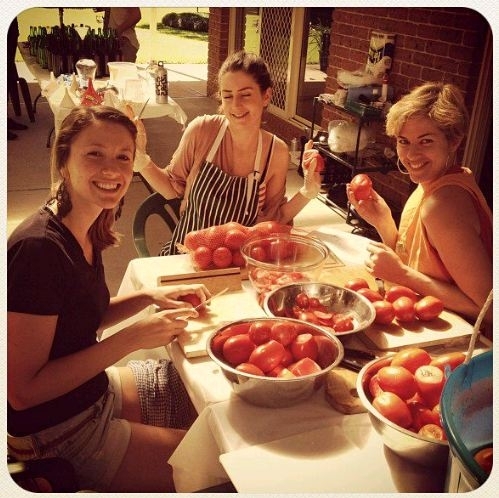 It was great fun and we hope that we encouraged new families around Melbourne to revive or start up a new family tradition of "Passata Day"! Check out some of the photos from the day on Facebook. There are many different methods to make passata. You can either blanch to soften the tomatoes, or cook them prior to putting them through the machine. You can also put the tomoatoes in raw and boil them once bottled. The recipe can be kept simple with just tomato and salt, or you can add basil, onion, chilli, sugar, garlic or other herbs and spices to the sauce prior to bottling. There are a lot of different recipes and it comes down to taste, or which region your family is from in Italy :) The beauty of making your own homemade tomato sauce is that you know exactly what's in it, and how you like it! If you are wanting to learn to make wine, beer, spirits, pizza, pasta, sausages, salami, tomato sauce, cheese, preserves or vinegar we can help you with our fun, interactive and hands-on Food and Beverage Workshops. For daily updates on courses, events, competitions and specials, you can also follow us on Facebook and Twitter! I look forward to sharing more news from the team at Home Make It.